In Dragons Den style, ha. It was my dad’s birthday recently and I took a whole bunch of photos of him playing golf on the beautiful course we basically lived on in Portugal for two weeks at Boa Vista. I always struggle to buy him presents, as like me, he buys everything he wants before his birthday or christmas! 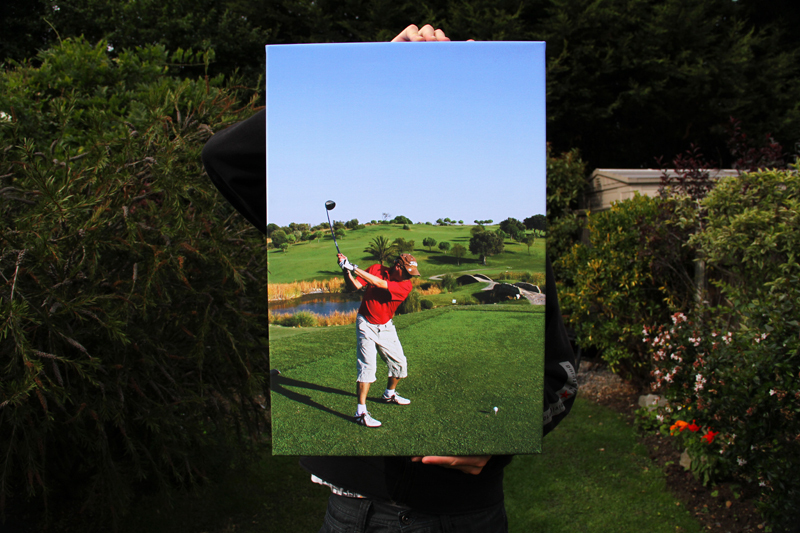 So I decided to get a canvas printed of the best photo I took of him on holiday, I’m really pleased with the quality! If your a Costco member it’s well worth using them. Essay – 500 words of my 5-6000 word thesis are complete. I have a lot of great sources and I have outlined the next part im going to write. 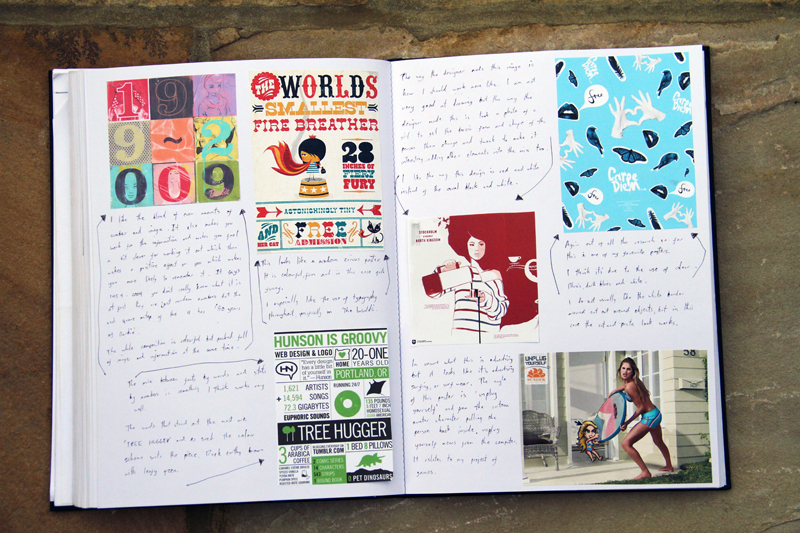 Practical – A couple of posts back I made a post about all the inspiration I had printed out. 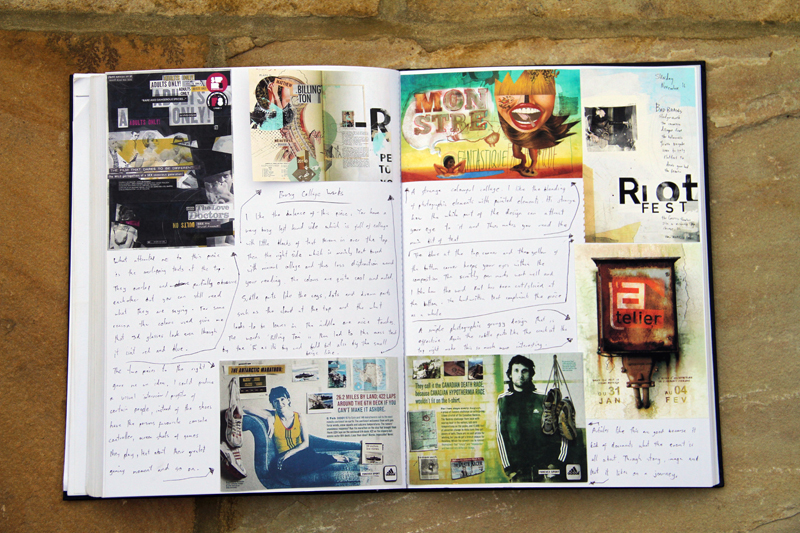 I took this book away with me to Portugal and filled in each and every page with annotation. Annotation is usually a weak point of mine as I try and fill everything in at the last minute and it doesn’t work. I thought id get ahead of myself. 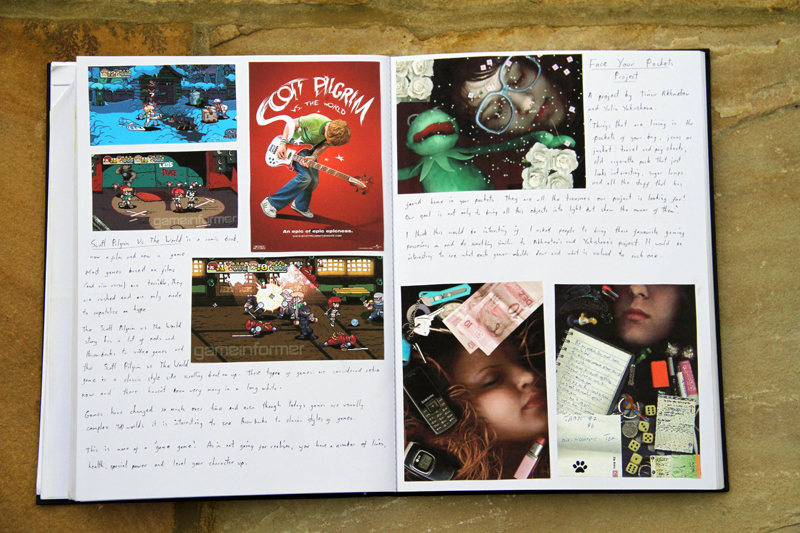 Also on the left hand side page below, Scott Pilgrim, I have now seen the film and played the game and I’m obsessed with it! It just so happens that it’s perfect inspiration for my chosen project. 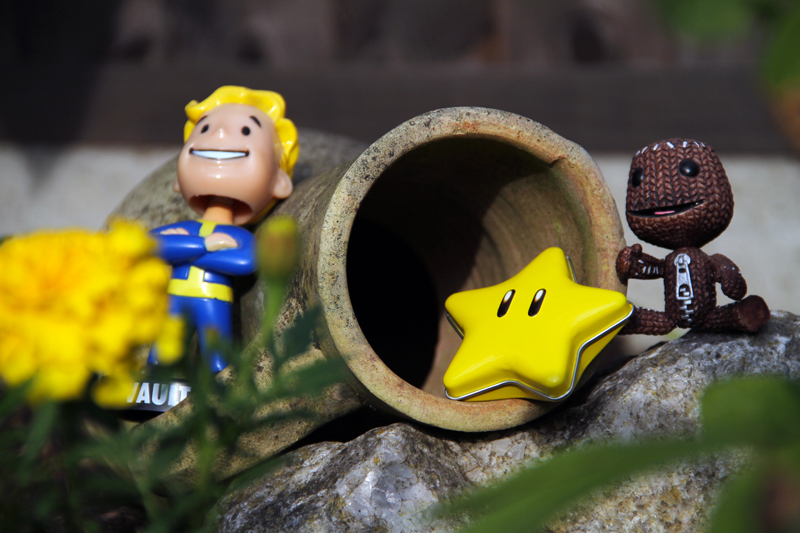 Self Brief – My topic is going to be gaming. Gaming was probably my first major hobby when I was very young, starting on the Amiga, which was basically just a keyboard with a floppy disc drive, to present day with the ps3 and xbox 360. There is so much history/progression/subject matter to play with on this subject that coupled with my love of it I think it would make a perfect last major project. The title idea I thought of first was – ‘What we can learn from games to make a better future‘. Although I think this title narrowed the subject down too far and as such think this is better suited – ‘The Relationship between computer games and people’. How am I going to go about doing this? Well I have done quite a bit of animation lately, taking risks and learning new skills is what I want to do to push myself this year. I have looked into book publishing websites and the best one seems to be ‘Blurb‘ . However I have thrown a quick book together in a day from some of the best bits from my old work to test the quality, and am awaiting delivery (should arrive Monday). So what is so risky about a book? I have never produced one for a start, I haven’t had much experience with InDesign and by the end of this project I should be very adapted to it. Also I think my typography use is weak so this project will also boost that skill. 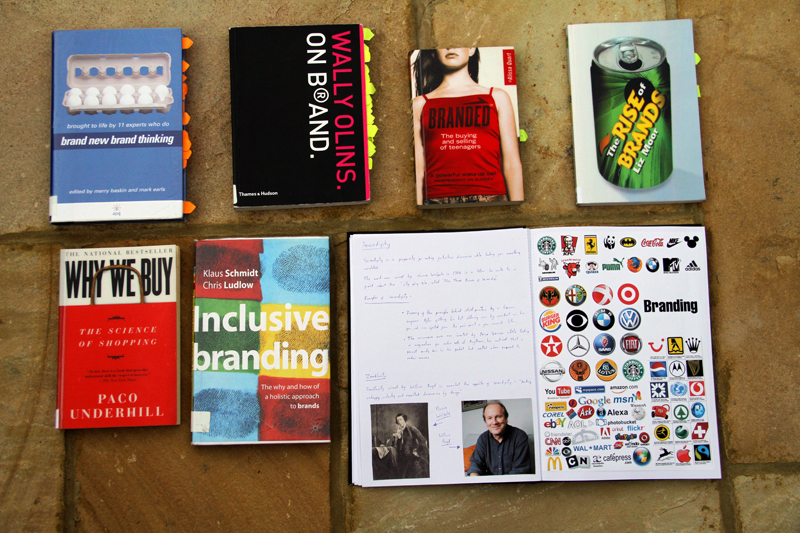 Through producing a book a lot of research, planning and actual producing is necessary under constant deadlines, I also like the idea of it all being in a tangible professional looking product at the end. An advantage here is I can also take double page spreads il be producing and have them printed out as big posters if needed (for exhibition use and what not). What is the book going to contain? I am going to do a lot of inital research, find and set out what I want to cover, pick thought provoking articles or find facts related to gaming and then transfer these into book form and obviously work it all out graphically. For example this article about why ‘death’ has always been a punishment in games – Article . I could take whole articles or take the best bits and produce a book that is not only interesting to read but is very visually stimulating too. Having gone to London yesterday to look at graphical books to help inspire me with this year I found a book along the same lines of what I want to do, I am going to order it after I publish this post, il make another entry when I receive it! Games are obviously very visual by nature and cover many graphical styles, as such I want each segment or article in the book to have it’s own individual look. This way I can be creative and experimental to make it graphically interesting and not samey. I am well aware that books and magazines strive to be consistent but in my opinion from a graphics stand point this isn’t all that stimulating. Also since the book is about games and like I have said it’s a very visual medium I think this is a good creative choice. My audience is obviously to cater to gamers but also hopefully to surprise people about the depth of gaming, who think it’s just a 12 year old kid’s obsession. Stay tuned for more. 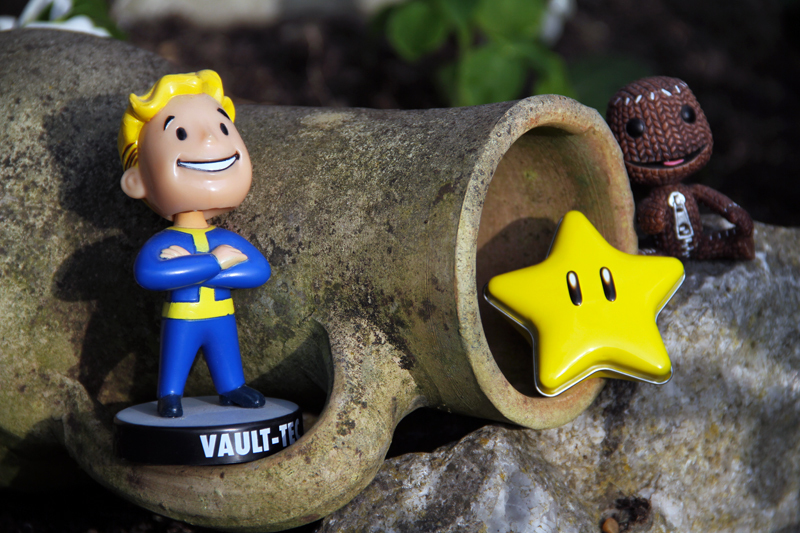 Also if you have any cool gaming merch, like I have shown in the photos or old gaming systems please comment or email me – chillcleal@hotmail.co.uk. This would be hugely appreciated! Thank you. I am writing this post to hopefully get some feedback on whether you personally think film title sequences add or take away from the experience, does it depend on the film? Do all films need them? etc. I will also put below some title sequences to help your judgement. Thanks for your time. Please vote in the poll below and also leave a better explanation in a comment if you can (you do not have to sign up or anything to comment or vote). Sorry about the words going off the poll but I can’t control that. The image below is the cover art for a game called ‘Borderlands’ which is to be released soon. It has stirred up mixed feelings in people. Advertising that promotes firearms or weapons of any kind is not allowed. “In conversations I had with Christoph Hartmann, President of 2k Games, it was really clear to me that he really believed in the value of the risks we were taking with the game and how it pushed things forward and he really was eager to push things with the box cover as well,” he added.Pitchford admitted this was by far the most bold cover art he’s ever been involved with, and is satisfied with the response he’s seen from fans so far.”Judging from the response so far, it looks like it was the right call,” he said. Personally I think the cover art is amazing and well executed, no pun intended. I totally agree with the part that I have put in bold and couldn’t wish this way of thinking on other mediums and their censorship organizations enough. Do you find this box art offensive enough to make you want it banned? Please leave your opinions in the comments and vote in the poll! First theory lesson of the year and we jumped straight in learning about ethics and morals, the fine line between them and how they are tied in with design. Also learnt about the difference between plagiarism and appropriation. I found it all very intrested but I find it hard to make sense or come to a judgement because questioning things like morals and ethics is tough because there is never going to be a yes or no answer most of the time. It will be intresting to look into further however and how it ties in with design in depth. I found a couple examples of ‘unethical’ advertising. Personally I found them really funny but I can see how some people may be offended by them. The adverts below are advertising a ‘Belgian humour magazine’. Do these offend you or do you like them, and why? Please voice your opinions. To read the ‘First Things First’ Manifesto please click here. To sum up this manifesto Garland is saying creatives should be put to a better cause by designing and creating things that will make our culture and awareness expand rather than putting all effort into consumer products. At the end of the day doing this is only making companies like Nike and Coca Cola more money. It’s not changing the world. I think the solution to the problem is for big companies to carry on selling their products and advertising as usual BUT to create a sub-section to their company that is dedicated to helping our knowledge and world expand through design. This way the company is selling/advertising their products as usual but are helping out with the more informative design. The advantage of this is that the informative design gets heard because of the companies brand recognition and their advertising money behind it so it doesn’t get lost in the information overload of today. Why would big companies do this? If they make it clear that they made it happen they will get a reputation boost and they can put their logo etc. on it which means more advertising for them whilst boosting reputation which equals more products sold for them! An example I can think of is the BBC’s ‘Planet Earth’ documentries which are an amazing series informing and showing us things about our world that we are never likely to discover ourselves. Imagine if companies like Nike and Coca Cola all done something similar to this, and how much more useful that would be, to make the world a less greedy and more informative place. Please leave your opinions on this topic.